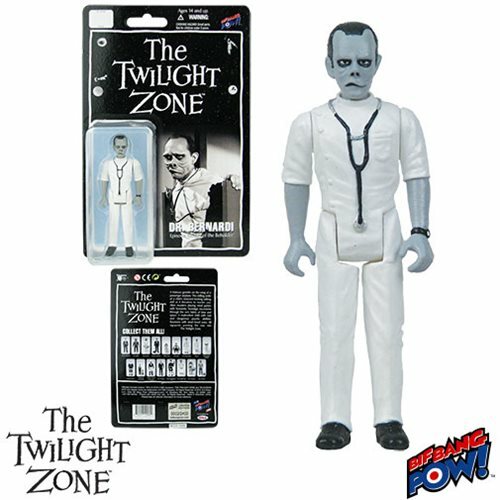 3 3/4-inch scale retro-styled action figure derived from The Twilight Zone. Limited Edition and individually numbered black-and-white version with five points of articulation. Truly, beauty is in the eye of the beholder. This handsome fellow is Doctor Bernardi from the second season's 6th episode entitled, "Eye of the Beholder," written by Rod Serling. This is a limited edition and each figure is individually numbered. Only 2400 pieces available from Bif Bang Pow!, this authentically detailed Doctor Bernardi figure measures approximately 3 3/4-inches tall and is crafted from plastic. He features five points of articulation, as well as the retro design of action figures from the 70s. Take him home today, where he will do his best to make your "not normal" figures look just like everyone else! Make sure to collect all the Bif Bang Pow! The Twilight Zone figures! Ages 14 and up.